Sept. 26, 2018, 11:17 a.m.
By H.G. Watson @hg_watson Sept. 26, 2018, 11:17 a.m.
A new report from Canada’s Public Policy Forum has measured the speed at which the nation’s newspapers are shrinking. The number of newspaper articles produced over the last 10 years has shrunk by almost half; wire service stories are taking the place of local political coverage; and of the articles still being produced, fewer include coverage of democratic institutions and civic affairs. The report, “Mind the Gaps: Quantifying the Decline of News Coverage in Canada,” emerged from an interest in finding out how much — if at all — news coverage has decreased over the past 10 years. “One of the black holes of information has been exactly what is the effect on coverage of our civic institutions,” said Edward Greenspon, president and CEO of PPF. The Public Policy Forum, with the consulting firm Nordicity, surveyed 20 anglophone and francophone communities across Canada, looking at the volume and depth of the articles, measured by factors such as the number of direct quotes in stories. Here’s what they found. Civic affairs coverage didn’t fall as far — but perhaps at the cost of other beats. While the total number of newspaper articles has dropped by almost half in the last 10 years — from about 11,000 stories a year to just under 6,000 — coverage of civic affairs hasn’t dropped as significantly. In 2008, just over 6,000 stories about civic affairs were published. In 2017, newspapers published about 4,000 stories about civic affairs. But that’s not unequivocal good news. The slower drop in civic affairs reporting may actually a symptom of cuts to other newsroom beats. “It may well be that publishers are trying to ‘protect the core’ by concentrating limited resources on covering civic affairs at the expense of other topics, or that institutional coverage is easier to maintain under resource pressures,” the report says. City hall coverage has fallen, while provincial political coverage remains steady. The depth of coverage hasn’t declined as quickly. The PPF surveyors also looked at depth of coverage of stories, measuring factors like the numbers of direct quotes used in a story, the presence of opposing perspectives, the inclusion of statistics and polling, historical context, and illustrative examples. There were declines — specifically in opposing views, historical context, statistics or polling, and illustrative examples — but overall, the report found that these declines are more of a slow erosion than the more significant volume drops of political stories. The effects vary by community. The PPF report looked at 20 communities across Canada, all varying in size. Some had experienced the closure of a local newspaper, which explains why those areas have seen such drops in the quantity of news coverage, especially at city halls. Bilingual newspaper markets seem to have not suffered the same drops in civic affairs reporting as in purely anglophone ones. But the researchers did find that the depth of stories in francophone markets was overall lower over the 10-year period studied. A version of this story ran at J-Source. 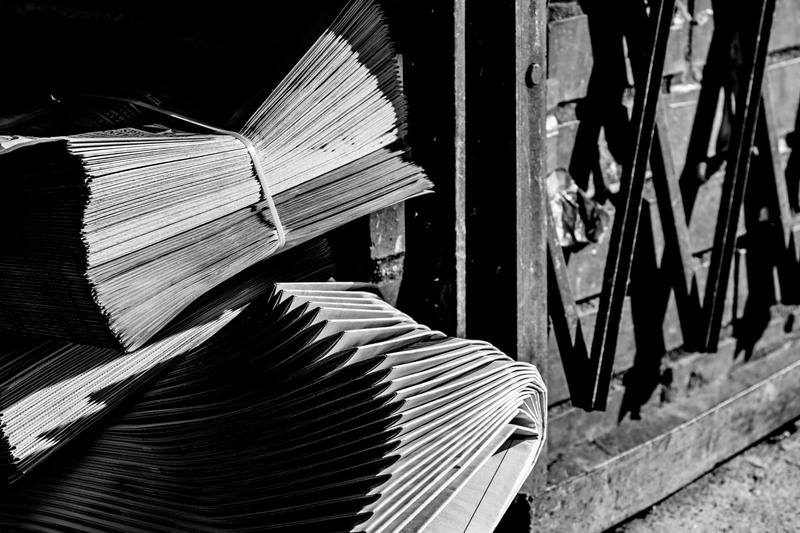 Photo of a stack of newspapers in Toronto’s Little India neighborhood by Kat Northern Lights Man used under a Creative Commons license. POSTED Sept. 26, 2018, 11:17 a.m.
Watson, H.G.. "In Canadian cities, the number of newspaper stories published each day has been cut in half in the last decade." Nieman Journalism Lab. Nieman Foundation for Journalism at Harvard, 26 Sep. 2018. Web. 25 Apr. 2019. Watson, H.G.. "In Canadian cities, the number of newspaper stories published each day has been cut in half in the last decade." Nieman Journalism Lab. Last modified September 26, 2018. Accessed April 25, 2019. https://www.niemanlab.org/2018/09/in-canadian-cities-the-number-of-newspaper-stories-published-each-day-has-been-cut-in-half-in-the-last-decade/.